First published in France in 1929, Magic and Mystery in Tibet tells the story of the author’s experiences in Tibet, among lamas and magicians. 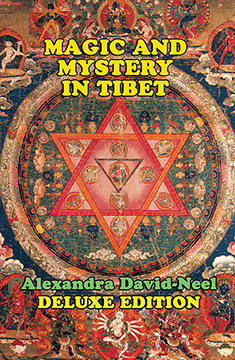 Alexandra David-Neel’s memoir offers an objective account of the supernatural events she witnessed during the 1920s among the mystics and hermits of Tibet—including levitation, telepathy, and the ability to walk on water! She tells of great sages and sorcerers that she met; of the system of monastic education; the great teachers and their disciples; Tibetan folklore about these spiritual athletes; reincarnation and memory from previous lives; elaborate magical rites to obtain enlightenment; the horrible necromantic magic of the pre-Buddhist Bonpa shamans; mental visualization exercises to create disembodied thought forms (tulpas); visions; phenomena of physical yoga, control of the body heat mechanism; breathing exercises; sending “messages on the wind”; and much similar material. An unusual aspect of her book is that she herself experienced many of the phenomena she describes, yet she describes them with precision and in a matter-of-fact manner, permitting the reader to draw his own conclusions about validity, interpretation in terms of psychology, and value. Particularly interesting for the modern experiencer are her detailed instructions for tumo (the yoga of heat control) and creation of thought projections. This deluxe edition has all of the original photographs plus additional photos and maps, as well as several introductions.